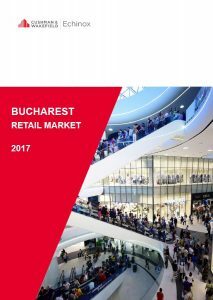 The modern retail stock in Bucharest reached 1.23 mil. sq. m at the end of 2017. Last year, the new supply was of 8,000 sq. m, after the opening of AFI Palace Cotroceni extension, which strengthened the shopping center’s position as the largest mall in Romania, reaching 90,000 sq. m GLA. The stock consists in 15 shopping centres with a total GLA of app. 700,000 sq. m (58% of the stock), 10 retail parks comprising a GLA of 391,000 sq. m (33%), while 6 commercial galleries (106,000 sq. m GLA) cover the remaining 11%. The general vacancy rate reduced from 4%, at the end of 2016, at 3%, with dominant projects being in the position to select new tenants from waiting list. The average density of modern retail space reached 635 sq. m / 1,000 inhabitants. 1st District of Bucharest, the wealthiest, has the highest density, with 967 sq. m / 1,000 inhabitants, but also the highest occupancy rate (99.9%) and the highest headline rent, with € 70 – 80 per sq. m / month. Going forward, Colosseum Retail Park and Promenada Mall will be extended, while new retail parks will be developed in Balotesti (DN 1 Value Center developed by Prime Kapital) and Theodor Pallady Bd. (developed by ERES on Policolor site).